As the school year approaches, days seem to get busier even as the heat of the season stays with us. One bowl dinners are great year round as time savers, balance made easy, and simple to add vegetables to the meal without an extra step. Grilling a leaner protein like a sirloin steak can help keep the heat out of the kitchen while helping keep fat and calories in mind. Marinating it adds some flavor and tenderizes leaner meat, too. Have kids help prepare the fruit and vegetable part of the meal to make it more appealing for them to try something new while getting important nutrients. For example, Vitamin C in vegetables like tomato helps that iron in the deep greens get absorbed. Vitamin C is also great for wound healing, and as the next school year approaches, iron is important for cognitive development, making this colorful salad a nice transition to a more veggie-filled meal. 1. 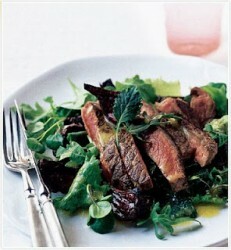 Place steak, onion slices and 1/2 cup dressing in a recloseable food storage bag; seal. Refrigerate and marinate several hours or overnight. 2. Prepare grill to medium-hot heat. Remove steak and onion slices from bag; discard marinade. Place steak and onions on grill. Grill steak to medium-rare, 145°F (about 9-11 minutes) or to desired doneness, turning once. grill onions until softened and charred (about 10 minutes), turning once. Grill avocado quarters until charred (about 3-4 minutes), turning once. 3. Thinly slice steak, st aside. Toss salad greens with remaining dressing; divide among 4 large salad plates. Top with steak, onions, avocados, tomatoes and blue cheese crumbles.